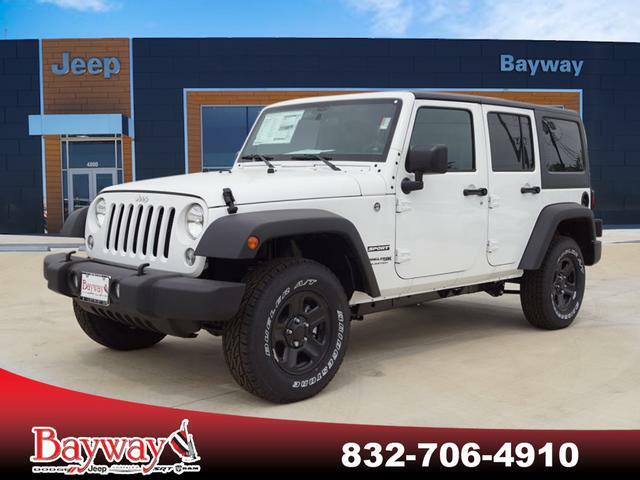 * 6 Cylinder engine * * Check out this 2018 Jeep Wrangler Unlimited Sport * * 2018 ** Jeep * * Wrangler Unlimited * This White 2018 Jeep Wrangler Unlimited Sport might be just the SUV 4X4 for you. It has a 6 Cylinder engine. The exterior is a charming white. Call today to schedule your test drive! Contact Information: Bayway Chrysler Dodge Jeep Ram, 4000 Pasadena Highway, Pasadena, TX, 77503, Phone: (713) 433-4000, E-mail: internetleads1660@car-crm.com. * 6 Cylinder engine * * Check out this 2018 Jeep Wrangler Unlimited Sport * * 2018 ** Jeep * * Wrangler Unlimited * This Gray 2018 Jeep Wrangler Unlimited Sport might be just the SUV 4X4 for you. It comes with a 6 Cylinder engine. The exterior is a sleek gray. Interested? Call today and take it for a spin! Contact Information: Bayway Chrysler Dodge Jeep Ram, 4000 Pasadena Highway, Pasadena, TX, 77503, Phone: (713) 433-4000, E-mail: internetleads1660@car-crm.com. 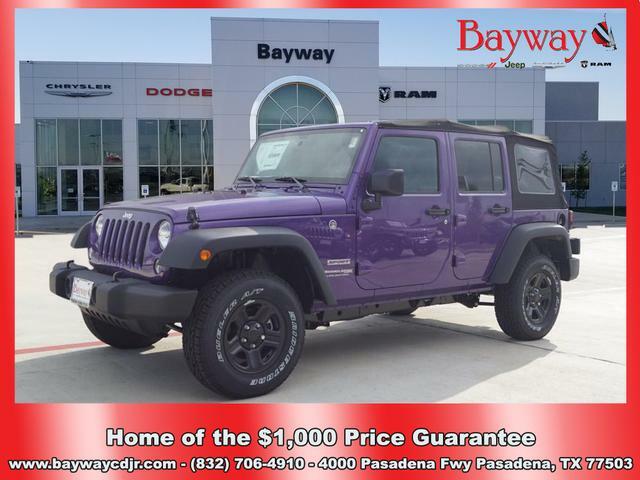 * 6 Cylinder engine * * Check out this 2018 Jeep Wrangler Unlimited Sport * * 2018 ** Jeep * * Wrangler Unlimited * This Purple 2018 Jeep Wrangler Unlimited Sport might be just the SUV 4X4 for you. It has a 6 Cylinder engine. The exterior is a suave purple. Call and schedule your test drive today! Contact Information: Bayway Chrysler Dodge Jeep Ram, 4000 Pasadena Highway, Pasadena, TX, 77503, Phone: (713) 433-4000, E-mail: internetleads1660@car-crm.com. * 6 Cylinder engine * * Check out this 2018 Jeep Wrangler Unlimited Sport * * 2018 ** Jeep * * Wrangler Unlimited * This White 2018 Jeep Wrangler Unlimited Sport might be just the SUV 4X4 for you. It has a 6 Cylinder engine. The exterior is a timeless white. Want to learn more? Call today for more information. Contact Information: Bayway Chrysler Dodge Jeep Ram, 4000 Pasadena Highway, Pasadena, TX, 77503, Phone: (713) 433-4000, E-mail: internetleads1660@car-crm.com. * 6 Cylinder engine * * Check out this 2018 Jeep Wrangler Unlimited Sport * * 2018 ** Jeep * * Wrangler Unlimited * This Black 2018 Jeep Wrangler Unlimited Sport might be just the SUV 4X4 for you. It comes with a 6 Cylinder engine. The exterior is a beautiful black. Interested? Call today and take it for a spin! Contact Information: Bayway Chrysler Dodge Jeep Ram, 4000 Pasadena Highway, Pasadena, TX, 77503, Phone: (713) 433-4000, E-mail: internetleads1660@car-crm.com. * 6 Cylinder engine * * Check out this 2018 Jeep Wrangler Unlimited Sport * * 2018 ** Jeep * * Wrangler Unlimited * This White 2018 Jeep Wrangler Unlimited Sport might be just the SUV 4X4 for you. It has a 6 Cylinder engine. The exterior is a beautiful white. Don't sit on this decision for long...schedule your test drive today! Contact Information: Bayway Chrysler Dodge Jeep Ram, 4000 Pasadena Highway, Pasadena, TX, 77503, Phone: (713) 433-4000, E-mail: internetleads1660@car-crm.com. 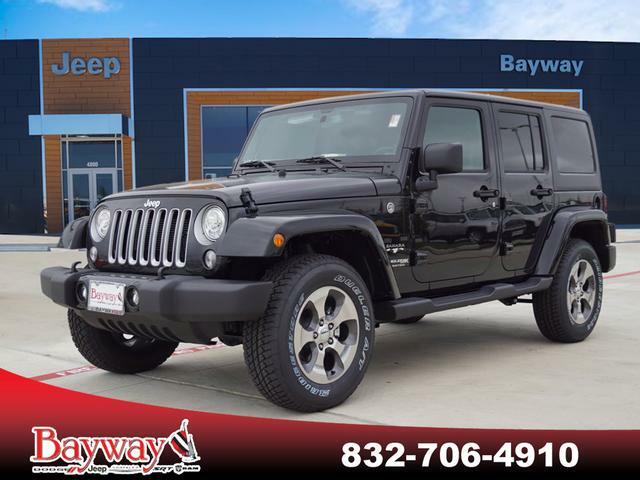 * 6 Cylinder engine * * Check out this 2018 Jeep Wrangler Unlimited Sahara * * 2018 ** Jeep * * Wrangler Unlimited * This Black 2018 Jeep Wrangler Unlimited Sahara might be just the SUV 4X4 for you. It comes with a 6 Cylinder engine. The exterior is a charming black. Don't sit on this decision for long...schedule your test drive today! Contact Information: Bayway Chrysler Dodge Jeep Ram, 4000 Pasadena Highway, Pasadena, TX, 77503, Phone: (713) 433-4000, E-mail: internetleads1660@car-crm.com. 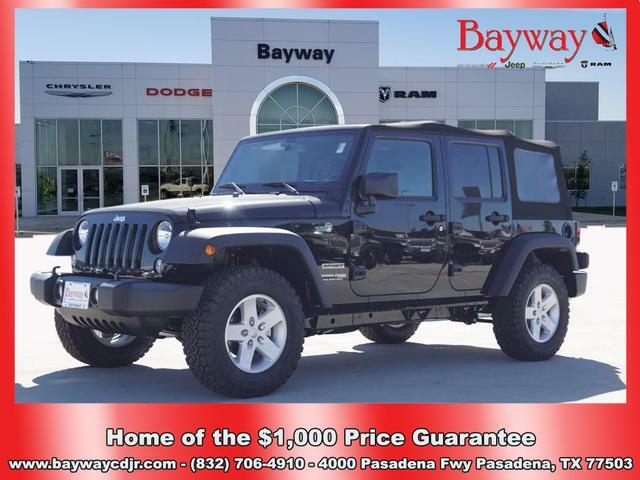 * 6 Cylinder engine * * Check out this 2018 Jeep Wrangler Unlimited Sahara * * 2018 ** Jeep * * Wrangler Unlimited * This Black 2018 Jeep Wrangler Unlimited Sahara might be just the SUV 4X4 for you. It has a 6 Cylinder engine. The exterior is a dazzling black. Call today to schedule your test drive! Contact Information: Bayway Chrysler Dodge Jeep Ram, 4000 Pasadena Highway, Pasadena, TX, 77503, Phone: (713) 433-4000, E-mail: internetleads1660@car-crm.com. * 6 Cylinder engine * * Check out this 2018 Jeep Wrangler Unlimited Sahara * * 2018 ** Jeep * * Wrangler Unlimited * This Gray 2018 Jeep Wrangler Unlimited Sahara might be just the SUV 4X4 for you. It has a 6 Cylinder engine. The exterior is a ravishing gray. Don't sit on this decision for long...schedule your test drive today! Contact Information: Bayway Chrysler Dodge Jeep Ram, 4000 Pasadena Highway, Pasadena, TX, 77503, Phone: (713) 433-4000, E-mail: internetleads1660@car-crm.com. * 6 Cylinder engine * * Check out this 2018 Jeep Wrangler Unlimited Sahara * * 2018 ** Jeep * * Wrangler Unlimited * This Gray 2018 Jeep Wrangler Unlimited Sahara might be just the SUV 4X4 for you. It comes with a 6 Cylinder engine. The exterior is a ravishing gray. Don't sit on this decision for long...schedule your test drive today! Contact Information: Bayway Chrysler Dodge Jeep Ram, 4000 Pasadena Highway, Pasadena, TX, 77503, Phone: (713) 433-4000, E-mail: internetleads1660@car-crm.com. 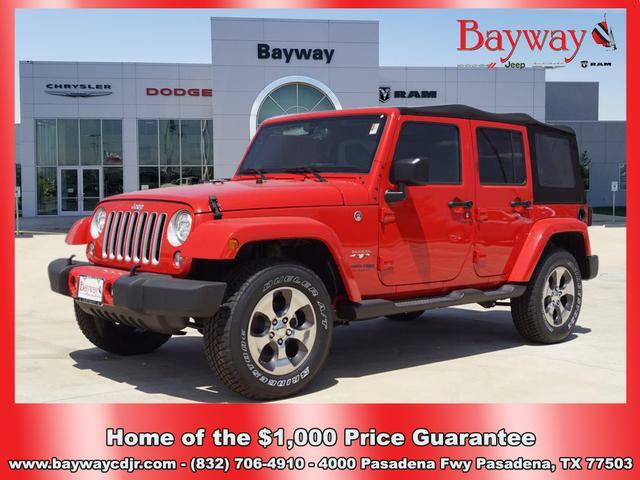 * 6 Cylinder engine * * Check out this 2018 Jeep Wrangler Unlimited Sahara * * 2018 ** Jeep * * Wrangler Unlimited * This Red 2018 Jeep Wrangler Unlimited Sahara might be just the SUV 4X4 for you. It has a 6 Cylinder engine. The exterior is a classic red. This is the vehicle you have been waiting for! Call now to schedule a test drive! Contact Information: Bayway Chrysler Dodge Jeep Ram, 4000 Pasadena Highway, Pasadena, TX, 77503, Phone: (713) 433-4000, E-mail: internetleads1660@car-crm.com. 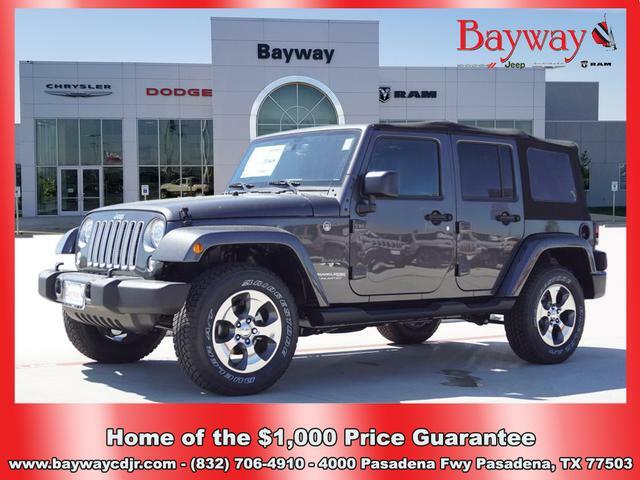 * 6 Cylinder engine * * Check out this 2018 Jeep Wrangler Unlimited Sahara * * 2018 ** Jeep * * Wrangler Unlimited * This Black 2018 Jeep Wrangler Unlimited Sahara might be just the SUV 4X4 for you. It has a 6 Cylinder engine. The exterior is a ravishing black. Want to learn more? Call today for more information. Contact Information: Bayway Chrysler Dodge Jeep Ram, 4000 Pasadena Highway, Pasadena, TX, 77503, Phone: (713) 433-4000, E-mail: internetleads1660@car-crm.com. * 6 Cylinder engine * * Check out this 2018 Jeep Wrangler Unlimited Sport * * 2018 ** Jeep * * Wrangler Unlimited * This Black 2018 Jeep Wrangler Unlimited Sport might be just the SUV 4X4 for you. It comes with a 6 Cylinder engine. The exterior is a gorgeous black. This is the vehicle you have been waiting for! Call now to schedule a test drive! Contact Information: Bayway Chrysler Dodge Jeep Ram, 4000 Pasadena Highway, Pasadena, TX, 77503, Phone: (713) 433-4000, E-mail: internetleads1660@car-crm.com. * 6 Cylinder engine * * Check out this 2018 Jeep Wrangler Unlimited Sahara * * 2018 ** Jeep * * Wrangler Unlimited * This Gray 2018 Jeep Wrangler Unlimited Sahara might be just the SUV 4X4 for you. It has a 6 Cylinder engine. The exterior is a charming gray. Don't sit on this decision for long...schedule your test drive today! Contact Information: Bayway Chrysler Dodge Jeep Ram, 4000 Pasadena Highway, Pasadena, TX, 77503, Phone: (713) 433-4000, E-mail: internetleads1660@car-crm.com. 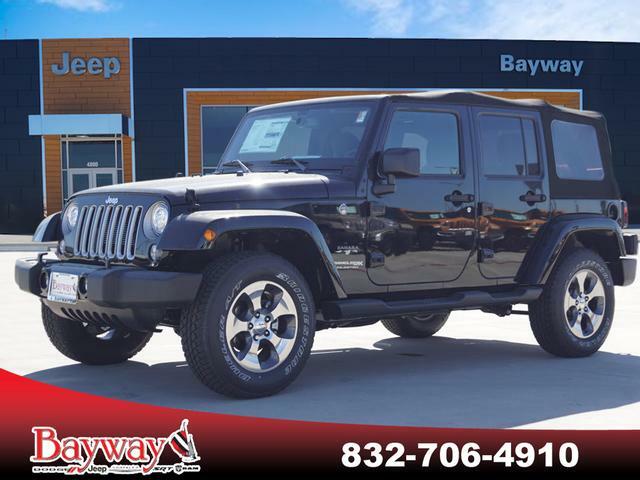 * 6 Cylinder engine * * Check out this 2018 Jeep Wrangler Unlimited Sahara * * 2018 ** Jeep * * Wrangler Unlimited * This Black 2018 Jeep Wrangler Unlimited Sahara might be just the SUV 4X4 for you. It has a 6 Cylinder engine. The exterior is a gorgeous black. View this beauty and our entire inventory today! Call for more details. Contact Information: Bayway Chrysler Dodge Jeep Ram, 4000 Pasadena Highway, Pasadena, TX, 77503, Phone: (713) 433-4000, E-mail: internetleads1660@car-crm.com. 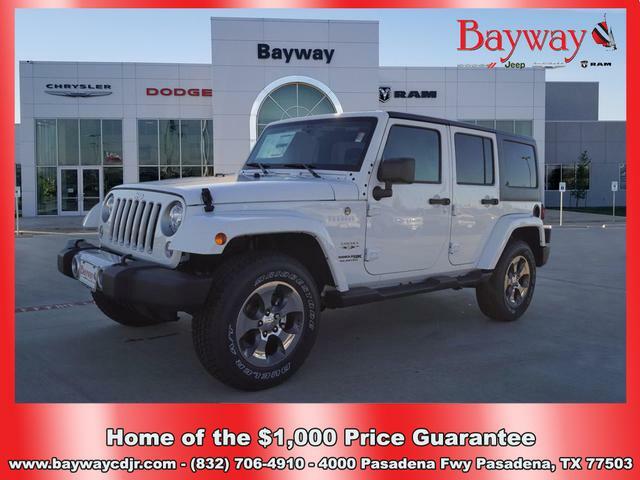 * 6 Cylinder engine * * Check out this 2018 Jeep Wrangler Unlimited Sahara * * 2018 ** Jeep * * Wrangler Unlimited * This White 2018 Jeep Wrangler Unlimited Sahara might be just the SUV 4X4 for you. It comes with a 6 Cylinder engine. The exterior is a suave white. Call today to schedule your test drive! Contact Information: Bayway Chrysler Dodge Jeep Ram, 4000 Pasadena Highway, Pasadena, TX, 77503, Phone: (713) 433-4000, E-mail: internetleads1660@car-crm.com.